IN all species of plants and animals that have been closely studied special particles of nucleoprotein are known which propagate themselves out of proportion with the other proteins of the cell. These particles are usually composed of RNA combined with protein. Usually also they are filterable and ultra-microscopic and they have the capacity of diffusing from cell to cell. They often come to produce the symptoms of disease. And when in addition they are habitually passed from one individual to another by infection in nature they are known as viruses. Viruses are recognised in an enormous number of stable and distinct types. They are genetic particles. How are we to distinguish them from plasmagenes? 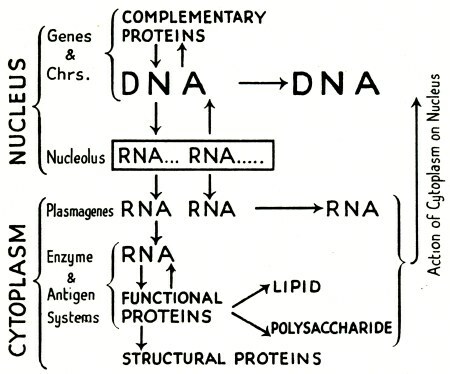 In regard to structure, since protein production is found to be correlated with the presence of RNA in cells generally, we must suppose that plasmagenes are RNA-proteins. In regard to effect, we find among both viruses and plasmagenes a wide range of relationship between the host (or mother) and the particle. Some viruses kill quickly; in plants they turn as much as four-fifths of their host's cell proteins into their own substance. Others, like the one responsible for breaking the colour in tulips, can reach equilibrium with their host which they will maintain for centuries. A smaller but similar range of types occurs, as we have seen, among plasmagenes. The best distinction we can make, the nearest to a distinction that we can reach, is to say that plasmagenes are transmitted, while viruses are not transmitted, through the germ cells in sexual reproduction.1 Turnip Yellows is carried by grafting and not by the seed: it is due to a virus. Strawberry Yellows is carried by seed and not by grafting: it is due to a plasmagene. This distinction is a basis of discussion. It is of great practical value for reasons which we shall consider later. But it is not ultimately valid. It breaks down in the same way as the distinction between the plasmagenes which are carried through germ cells and those which are not. And its breakdown naturally concerns the evolution of genetic systems. Let us take certain examples of this breakdown. Much more striking is the change when a plasmagene spontaneously or through treatment breaks through its reproductive equilibrium in its own mother organism and, having multiplied without limit, becomes infectious. This crisis is known to happen in a number of species of moths where polyhedral viruses arise without infection inside the caterpillar. In the silkworm they arise after feeding with specific chemical agents.5 In the tiger moth they arise after inbreeding, that is after changing the nuclear genotype. The spontaneous virus in the moth Abraxas grossulariata takes the argument a step further for it arises only under specific genetic conditions. The origin of the virus is confined to a particular recessive nuclear genotype, that of the mendelian segregate known as the variety lacticolor.2 Having arisen in lacticolor the virus can infect moths which are not of this genotype. The simplest assumption to make is that particles which exist as part of the normal cytoplasmic systems of the moths can become dangerous and infectious viruses. And this change can be induced by conditions which are either nuclear or nutritional: either internal or external to the organism. It has been frequently suggested that potatoes or moths which generate viruses spontaneously must have always carried such viruses in a 'latent' state. But there seems to be no more reason for ascribing the harmless condition to a latency of a virus than the dangerous condition to the virulence of a plasmagene. Indeed there is less reason. We do not know the past history of such a particle. We can assume that it has a history of self-propagation. Since the virus is fatal no ancestor of A. g. lacticolor could have developed it. We therefore have to suppose that the effective particle was not carried through the egg but was generated during development by the action of the newly-constituted lacticolor nucleus. In the same way we have to assume that a virus comes into being by the action of a Vigna nucleus on a Beta plasmagene. How are we to classify the particle responsible? Clearly it had arisen in the cytoplasm. It was a plasmagene. It had two abnormal properties, one of them unfavourable to the race that bore it. It interfered with the synthesis or maintenance of chlorophyll; and it multiplied itself so fast as to allow of diffusion through grafting. It had evidently not acquired the properties of a true virus, however, since it was not spread naturally by infection, and would quickly have died out in nature. It was a potential virus, a provirus. And how has the difference from a normal plasmagene which made it into a provirus been acquired? Either through innoculation from another species by an insect, as in the virus experiments. Or through mutation in Capsicum itself, a mutation in the cytoplasm no doubt conditioned by an abnormal nucleus. Why do we say that the distinction between virus and plasmagene by their mode of transmission, infection or heredity, is a practical one? Because any new self-propagating particle in the organism will depend for its survival either on the success of its host, the organism in which it multiplies, or on its own success. If it depends on the success of its host the closer its combination, or we may say identification, with its host the better for it: and the closest combination, the only identification is by heredity, by egg-transmission. If, on the other hand, it depends on its own success the greater its freedom from its host the better for it. No freedom is possible in plant or animal heredity. But in the cytoplasm freedom is possible by changing heredity to infection. Thus, where the particle is balanced in its propagation and benefits its host an adaptation towards heredity must be favoured. Where the particle is unbalanced in its propagation and injures its host an adaptation towards infection must be favoured. The nucleus, as we have learnt from plastids and from rogue plasmagenes, is continually reacting with all cytoplasmic particles in regard to their propagation and mutation, indeed in regard to the integration of the cell. The materials for selection are therefore always available. In these circumstances an intermediate or ambiguous position cannot long be maintained in the evolution of a particle. The instability of intermediate positions is quite unconnected with another kind of instability which is to be inferred from the developmental evidence. In rogue peas and rogue tomatoes the process of development shifts the character or concentration of a plasmagene. In Drosophila we find the same.8 The plasmagene responsible for sensitivity to CO2 is not naturally infectious but it can be inoculated into a non-sensitive female. She then produces some sensitive and some non-sensitive progeny. Only in some of the sensitive progeny does the condition become stabilised and true-breeding like the rogue character in peas. But the change L'Héritier is able to prove is a change, not in the sensitivity plasmagene itself, but in other cytoplasmic constituents; it is a change induced by the introduction of a new plasmagene into the system. He has demonstrated interaction and integration in the plasmagenes of the cell as a whole. The next connection in which we have to study the relations of heredity and infection and the integration of the cell is that of micro-organisms. 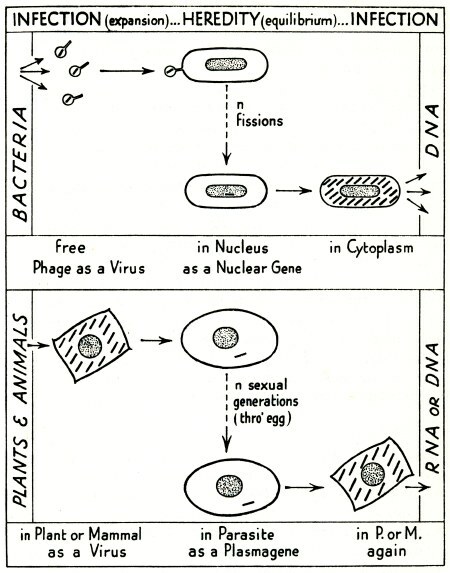 The discovery of the means of sexual breeding in yeast by Winge and in Paramecium by Sonneborn, both in 1936, opened the field of microbial genetics. Now in most unicellular organisms only the one cell fusion of fertilisation and the two cell divisions of meiosis separate mature representatives of successive generations. Inevitably therefore the contrast between heredity and development partly breaks down. For the same reason the distinction between body cells and germ cells also disappears. Genetic particles which have gained admission to a cell by infection cannot be excluded from heredity save by a differentiated life cycle. As yet we have no evidence of such an exclusion. It is not surprising therefore that the contrast between heredity and infection also partly breaks down in unicellular organisms. Certain individuals of the infusorian Paramecium aurelia carry in their cytoplasm some hundreds of self-propagating particles. These are known as kappa particles. They consist of DNAprotein and are about 2 microns in diameter. Their existence and their properties Sonneborn discovered first from breeding experiments and later from direct observation. The kappa particles, like the plastids, demand a suitable constitution in the nucleus to provide for their propagation and, like the plastids also, they exist in various genetic forms with their own sizes, activities and rates of propagation.9 Unlike plastids however they produce a substance which kills individuals not carrying kappa. The population is therefore divided into Killer and Sensitive individuals. The particle, at a cost of a trifling tax on its host, removes competitors,10 and the species enjoys what for nuclear variants is described by Ford as a balanced polymorphism. When, by special arrangement, Killers are brought to mate with Sensitives the kappa particles do not usually pass over during the exchange of nuclei. They are thus always cytoplasmically inherited and usually maternally inherited. And they are not in any sense infectious either in nature or in experiment: they kill at a distance if they kill at all. The kappa particle may have arrived in Paramecium by infection. But it may equally have evolved through many ages like the plastids of plants which chemically, physiologically, and genetically, it so closely resembles. And today it certainly exists in Paramecium by virtue of the good it does to its host and not the harm. It has followed the selective line of a plasmagene and in no respect that of a virus. Perhaps the greatest interest of kappa to us is in bridging the gap between genetic particles in the higher organisms and in bacteria. For in bacteria, where also the whole body is a germ, the evolutionary distinction between heredity and infection becomes crucial for the understanding of heredity itself. An infection of bacteria was discovered by d'Hérelle in 1915. He gave the name of bacteriophages to the infective particles. Today we know that most species of bacteria found in nature are subject to infection by bacteriophages which arise usually from individuals of their own species. And no other form of infection of bacteria is known. Phages consist of particles of nucleoprotein. They are from 200 Å to 1000 Å in diameter. Like nuclear genes they contain DNA; but their DNA has an inert coat of protein. When a single bacterium breaks down its explosion releases a hundred or more of these filterable particles each of which can infect another bacterium. The new host, if it happens to be susceptible, in turn breaks down twenty minutes later. Its metabolism has been shifted from producing its own DNA and protein to that of the phage. It is therefore able to release a hundred phage particles instead of itself reproducing. Phage-resistant bacteria are now believed to be of two kinds. There are some that are able to absorb the particular phage without breaking up; and there are some that reject it because they have already absorbed it. The resistant bacteria which contain the phage have it propagating itself in equilibrium within them, like kappa particles in Paramecium or the plastids in Euglena. Indeed the host cell may under special conditions multiply too quickly for its guests. Thus, as happens with Paramecium or Euglena, its progeny may become guest-free. Then they are again susceptible to invasion by a new phage particle. How does the phage exist in its permanent bacterial host? The first steps in solving this problem have been the remarkable experiments of Lwoff.12 Phage cannot be extracted artificially by rough handling. Anaerobic conditions or chemical lysis do not release it. Only certain treatments have this effect. And then only after a delay during which DNA production is shifted back from the bacterium-making state to the phage-making state. These special treatments are of the kinds which cause gene mutation and chromosome breakage in the higher organisms. That is X-rays, reducing agents, and the wavelength of maximum absorption by the pyrimidine bases of DNA (about 2600 Å). The treatment must be accompanied by a complete nutrition. And even so the reaction of the bacterium is genotypically variable. The evolutionary relations of bacterium and phage are thus partly intelligible. The invading particle exists in alternating states, as Lwoff suitably describes them, of phage and prophage. These states correspond in a general way with the virus and provirus of cytoplasmic particles in higher organisms. Finally, in Escherichi, marker differences which show linkage in conjugation experiments are carried over together in transduction experiments.18 The recombinations arising in these three ways, two of them natural ways, rest it seems on the same basis of structure. And from them we can conclude something with regard to this structure. Bacteria must contain genetic materials with the linear permanence of chromosomes and like chromosomes depending for this permanence on a DNA fibre. Further processes analogous to nuclear fusion and meiosis, that is analogous to a sexual cycle, must also occur in bacteria. Direct observation of nuclear structures does not help in extending this conclusion. The mechanism of transduction may, on the other hand, provide the clue to the nature both of the gene string and of the sexual cycle in bacteria. To find this clue we must pose the question: how is the free genic material, either with phage transduction or with chemical transformation, fixed in the gene-string of the recipient bacterium? The simplest assumption is that it takes the place of a small polymerised segment of DNA in the reproduction of the gene-string. The introduced polymerised particle slips into position in sequence with unpolymerised nucleotides and so produces a changeling copy. This kind of supposition involving chemical competition was formerly used to account for crossing-over and chiasma formation at meiosis in higher organisms. But it failed to account for the frequencies and arrangements of chiasmata. Here however the frequencies of transduction depend on the opportunities of infection and not on the regulated mechanics of chromosome pairing. And they are of the order of one per million cells not ten or twenty per cell. How then are we to conceive of the genetic system of bacteria? They contain a nuclear element composed of gene-strings or chromosome-like fibres. This element controls the hereditary properties of the organism and the genetic character of the vegetatively propagating clone. The gene-strings in the course of their reproduction can incorporate small fractions, short pieces of polymerised DNA, which come to them by infection. If such fractions fail to be incorporated or integrated or intercalated in new gene-strings they may multiply on their own as prophages to be again propagated by explosive infection. So much we know. But we do not yet know whether the process of sexual reproduction in bacteria depends on an exchange of phage-like particles as in transduction or whether it corresponds with the processes of higher organisms. Consequently, we cannot unreservedly speak of haploidy or diploidy or even of chromosomes at all. Nor can we certainly distinguish on the breeding evidence between genetic particles in the nucleus and in the cytoplasm. Or, if we distinguish between nucleus and cytoplasm, we must say that phage particles choose on each occasion whether they will propagate themselves in one or the other. On the evolutionary scale however they have no choice between heredity and infection: they are committed to both. This is true of the temperate phages. On the other hand there seems to be a complete gradation among bacterial genes between violent phages strongly committed to infection and steady particles completely committed to heredity and the chromosome. From what we now know, the phage-prophage cycle is a key process for the bacterial population as constituting a genetic system. By the alternation of lysis and infection the bacterium achieves the same general result as is achieved by sexual recombination. It accomplishes an exchange of the genetic material responsible for an adaptive and balanced polymorphism. The exchange is superficially under deep disguise. The wastage of genetic material is even higher than that arising from the production of the germ cells of the higher organisms. Fig. 33. Diagram to show how the same genetic particle may behave alternately as a virus and as a plasmagene, being transmitted at one stage by infection, at another by heredity. Above: the Lwoff cycle in bacteria which depends on changing genotypic-environmental reactions within one species. Below: the cycle in higher organisms which depends on a relation between two species of higher organism, host and parasite; either plant and insect (e.g. Trifolium and Agalliopsis for Clover Club Leaf) or mammal and tick (e.g. man and Dermatocentor for Rocky Mountain Spotted Fever). And with phage and bacterium the mortality of the results of fusion may be even higher than that with sperm and egg. The mortality is also a sudden and direct consequence of the genetic process. It does not, as with the higher organisms, arise from a long sequence of relative disadvantages. But in both large and small organisms the mortality is differential among genotypes. It is selective. Indeed, when we allow for the difference in reproductive economy, we see that the bacterium-phage device is appropriate as a means of attaining the corresponding benefit. It exposes genetic recombination to natural selection. The contrast between micro- and macro-organisms in the relations of heredity and infection now becomes clear. In the higher plants and animals no compromise is possible between heredity and infection. It has to be one or the other. The evolutionary path bifurcates and we only meet an uncommitted particle at the moment of its origin. In the bacteria, on the other hand, the choice is not in evolution but in the immediate course of events. The phage either destroys its host or it becomes a part of its host's heredity: only later in this case does it destroy the posterity of its host or a fraction of it. Infection and heredity alternate in the life of the same genetic particle. Most tissues of the higher animals and plants stop undergoing mitosis at a certain stage of development. Or they undergo mitosis to meet the regulated needs of repair or replacement. But from time to time cells arise which disobey this limitation. They continue mitosis in an unregulated way to produce a tumour. Or, going further, they increase their rate of mitosis. They lose the differentiated structural and immunological character of their cells. They return to an embryonic condition. Even, in animals, they may acquire motility and spread in the body fluids to other parts of the body setting up centres of malignant growth. Such is the nature of cancer. Clearly its origin lies in a change occurring in a cell at a particular moment. It must be a genetic change for two reasons. First it may be induced by special treatment with so-called carcinogenic substances which are different for animals and for plants. And, secondly, it can continue for ever in the progeny of the changed cell. It can also be transplanted unchanged from one animal to another. The evidence of a genetic change is shown conversely by special situations in which a pseudo-cancerous condition arises not by genetic change but as a regular event. In a certain species of Sorghum, as we noticed earlier, the pollen grains of plants having extra B chromosomes regularly undergo extra mitoses. DNA and protein are, as it were, pumped into the nucleus. The pollen grain by this polymitosis turns almost its whole substance into nucleus and becomes what in medical terms would be called an encapsulated tumour.20 Now, here the fatal event is regular: it is fixed in time and place. It must therefore be directly determined by the character of the genotype with its observably odd chromosome complement. It cannot be the result of mutation either in the nucleus or in the cytoplasm. The frequency with which the genetic change of carcinogenesis occurs is indeed characteristic of the type of cell in which it occurs. That is to say it can be specified for a particular strain, or particular genotype, of animals, such as rats and mice, and also for a particular tissue and particular stage of development. Such a degree of predictability is found in both gene and plasmagene mutations. In the first place, mitosis in tumours is often exceedingly rapid. In consequence the distribution of the chromosomes is irregular. Cells are formed with a great variety of chromosome numbers. One tumour may even give rise to diverse fixed strains with diverse fixed chromosome numbers. These maintain the cancerous property of morbid mitosis.22 It is difficult to imagine a gene mutation which could regularly override in its effects such gains and losses of whole chromosomes which follow from it. In the second place, the primary cancer mutation is characteristically followed by secondary changes enhancing the exaggeration of the rate of mitosis. How such a sequence of changes could take place following gene mutation is likewise difficult to imagine. But any great change in the rate of mitosis affects differentially the genetic particles in the cytoplasm. What is the alternative, the cytoplasmic, view of the origin of cancer? It is that at different stages of development different plasmagenes are balanced in their propagation in the cell. They are balanced in reaction with their nucleus to produce the amount of growth and the kind of growth characteristic of each tissue. A change in one of these plasmagenes, especially favouring its own propagation, will upset the balance. It may lead to a deficiency or an excess of mitosis. A deficiency will have no detectable effect. An excess, on the other hand, will further distort the balance since the mutant plasmagene will propagate out of proportion to the rest of the plasmagene system. Secondary and exaggerating effects will therefore be likely to occur such as are always the basis of malignancy. This is true of leukaemia in mice. The diffusible cancer particle is sometimes infectious in nature like the agent of myxomatosis in rabbits. And sometimes it is only infectious by human intervention like the agent of the Rous Sarcoma in fowls. In the first case we have a genuine virus which may very well have arisen recently by plasmagene mutation. In the second case we have a provirus which can certainly have arisen in no other way than by plasmagene mutation. Our immense knowledge of cancer which we owe to the vast proliferation of cancer research in the present century is here summarised in a short space. It is summarised in its purely genetic relations. These are clarified by our general knowledge of genetic systems which tells us what is possible in the reactions of nucleus and cytoplasm and what is impossible. They also justify to the more practical student the trouble we have taken in analysing such apparently inconsequent properties as CO2-sensitivity in Drosophila and rogues in peas. When we look at the external properties of organisms, those properties with which a biologist begins his study, we notice various aspects of behaviour under which we are compelled to classify our observations. Heredity, development and infection seem to be the great headings of our subject. But when we get inside these problems microscopically, chemically and experimentally, the great headings are seen to be descriptively and superficially convenient but not ultimate. The ultimate agents are the particles of molecular size and organisation whose capacity for self-propagation must underlie all genetic processes. What are these genetic particles? All genetic particles are, it seems, proteins combined with nucleic acids. Many, especially the larger and more elaborate particles, are combined with DNA. They are organised in the chromosomes of nuclei, in the larger viruses and in bacteriophages. The smaller particles are combined with RNA; they are the smaller viruses and the plasmagenes which in part seem to be interchangeable. If we may judge from the crystallisation of viruses these particles have a variety of structures. But what interests us here is to classify them by their behaviour, or more particularly their movements. Particles in the cytoplasm fall into three groups in respect of their movements or mobility. First, there are organellar genes or plastogenes which, like the nuclear centromere with its spindle fibre, are attached to their products. And also marked by their products. They are localised or specialised in different ways according to the organism or the tissue. Such are the plastids in plants and the kappa particles in Paramecium. Secondly, there are those particles which although unattached and unmarked are nevertheless fixed in the cell where they began. They may then multiply evenly during development and in consequence pass predominantly through the egg in heredity. They may also multiply unevenly in development with the variety of consequences, such as passing predominantly through the male germ cell, seen in rogues and elsewhere. If these particles are long-lived they will appear to be independent of the nucleus and independent also of the cyclical changes of development: they are then described as plasmagenes of heredity. But if they are short-lived they must owe something to the initiation of the nucleus. They then appear as plasmagenes of development. And they are the basis of differentiation both normal and abnormal. Thirdly, there are those particles which can diffuse from cell to cell. They are therefore transmissible by grafting. And they are useless in differentiation. But they sometimes have the capacity, if transplanted by experimenters or predators, of becoming viruses. They prosper differently in different tissues and are usually excluded from the germ cells altogether. These are the proviruses and the new viruses of the higher plants and animals. For the ambiguous or uncertain particle we have to consider carefully its known or possible history. It is not enough to ask what it is. We have to ask also how it came there. Above all we have to distinguish experimental from natural conditions. Sometimes we have to suspend judgment on origins; often we do not even know whether a particle is of animal or plant origin. These variations of reproduction are now widely attributed to a distortion of the copying process which underlies the reproduction of genetic particles; a distortion which can maintain itself for a short or long period in the absence of the original stimulus. Such subordinate kinds of genetic particle we shall return to consider later. If we now compare the relations of our series of genetic particles we see them falling in to a hierarchy which begins at its most permanent and most elaborate and most independent with the organisation of the chromosomes and ends at its least permanent and least elaborate with particles which can actually react with things outside the organism, that is with the environment. A scheme of this hierarchy is represented in the diagram. Stability of equilibrium in relation to the cell as a whole concerns us in all cytoplasmic particles. The nucleus and most organellar genes are fairly strictly co-ordinated and synchronised with the cell as a whole. Where the co-ordination fails, as we have seen, polyploidy and other kinds of mutations arise. But the free plasmagenes are not always so co-ordinated. Variations of development and of temperature upset the co-ordination and have been of crucial value in analysing the cytoplasmic system. The great source of variation in cytoplasmic particles however arises from their relations with the nucleus. Some nuclei, as in the tomato, may pass plasmagenes into the cytoplasm. Some nuclei, as in Paramecium, may maintain plasmagenes in the cytoplasm. And some nuclei, as in maize, may cause plasmagenes, either free or organellar, to mutate. Our experience being so fragmentary, it is no more than an experimental accident that one of these relations has been found in one organism and one in another. In general all the genetic components of the nucleus, the genes of the chromosomes, are accurately balanced by the selective processes of evolution. They have to be balanced because they are fixed and because they interact. We also see that all the elements of the cytoplasm, although they are not fixed, are similarly balanced at any one time because they similarly interact. The whole of the nucleus and the whole of the cytoplasm, all the genetic particles in the cell, are mutually selected and adjusted to make a successful cell. And the whole succession of processes is selected and adjusted to make a successful organism. In one evolutionary respect we must note an important distinction between genetic particles in the cytoplasm and in the nucleus. In the cytoplasm they often respond directly to changes in the environment. Particles that are not needed in the dark are lost in the dark. An adaptive change occurs. The effect of disuse is inherited. When this happens in microbes where each cell division gives rise to a new organism we have the appearance of a Lamarckian principle in evolution. We may accept this description with the proviso that it is evolution backwards and it is evolution in a subordinate particle, a cytoplasmic particle. The exception helps us to understand the predominant role of the nucleus, the peculiar functions of the chromosomes and of DNA in evolution as a process of forward change. The greatest, most elaborate and most enduring of these processes of forward change is in the evolution of heredity itself and this we must now consider. 2 K. M. Smith, 1952. 4 Darlington and Mather, 1949. 5 Yamafuji et al., 1954. 11 Burnet and McKie, 1929. 14 Lederberg. 1948; cf. Hartmann, 1957; Jacob and Wollmann, 1957. 15 cf. Stocker et al., 1953. 20 Darlington and Thomas, 1941. 21 Darlington, 1948, 1949b and c.
24 F. M. Burnet, 1956. 25 cf. Medawar et al., 1956. 26 A. D. Thomson, 1956.